Park Central Condominiums is a conversion property (meaning it was built first as apartments and then converted to condominium ownership) in 1999. Located on Juniper Street, just south of 14th Street, Park Central has 397 homes, featuring 18 different floor plans, and over 600 parking spaces! 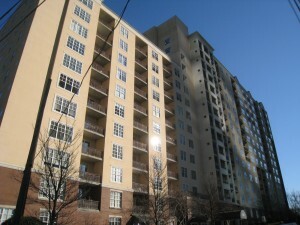 These include 33 GUEST spaces…a big plus in Midtown Atlanta condominium living! Park Central boasts impressive amenities, including a fitness center/health club that has a SAUNA and an INDOOR POOL…both a “one-of-a-kind” in Midtown condo living. Additionally, there is an outdoor pool, grilling area, and a roof-top terrace. The building has 24-hour Concierge service and controlled access into the building, garage, and elevators. If you are looking to buy or sell in Park Central Condominiums, understanding the market trends will better help you make an offer on a home for sale, or determine your pricing strategy if you are selling your Park Central Condominium. Data last updated: 4/15/19 8:43 PM PDT. If you are looking to Buy or Sell a home at Park Central Condominiums, MyMidtownMojo can help! Selling: Do you want to sell your Park Central Condominium? Call us today at 770.713.1505 to schedule your free market analysis of your home. Or you can complete our Seller Information Form. Are you “upside down” or owe more than your home is worth? If you need to sell your home, you have other options besides a foreclosure, such as short selling your Park Central Condominium. Buying: Are you looking to buy a Park Central Condominium? We can search for you, and even build you a custom website that will alert you daily of any new listings in the building. Just complete our Buyer Information Form and we’ll get to work!